The composer of that unforgettable violin melody at the heart of Young Frankenstein, and so many more great scores for Mel Brooks movies, died on Thursday in New York. 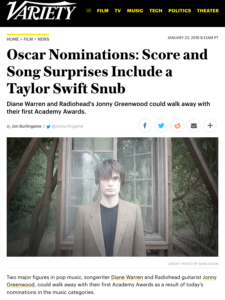 John Morris, twice Oscar-nominated (for co-writing the hilarious Blazing Saddles song and for his heartfelt dramatic score for The Elephant Man), had long ago retired from the business. 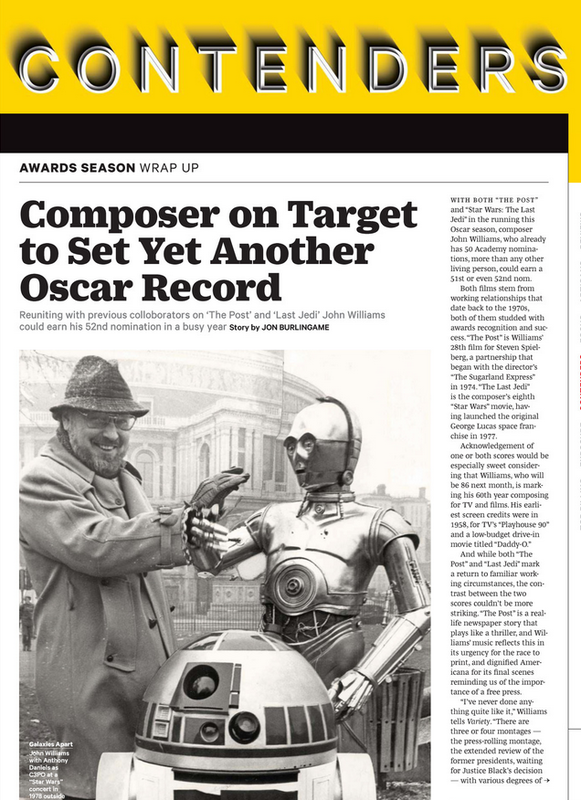 But his themes for the movies of Brooks, Gene Wilder, Marty Feldman and others — plus a handful of major television scores including The Adams Chronicles and Scarlett — are among the most indelible of the last 50 years. His passing has brought a surprising outpouring of grief and appreciation from the Hollywood music community. 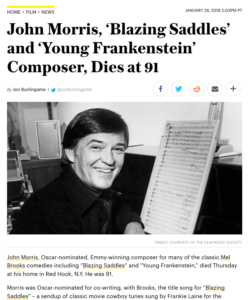 Here is the obituary I wrote for Variety; we first met in the early 1990s and I last talked to him in 2006 when I was writing the program notes for a Chicago Symphony performance of Young Frankenstein and other Morris scores. This entry was posted in Composers, Film Music, Obituaries and tagged Blazing Saddles song, John Morris, Mel Brooks, music for movie comedies, Variety, Young Frankenstein on January 29, 2018 by Jon Burlingame. 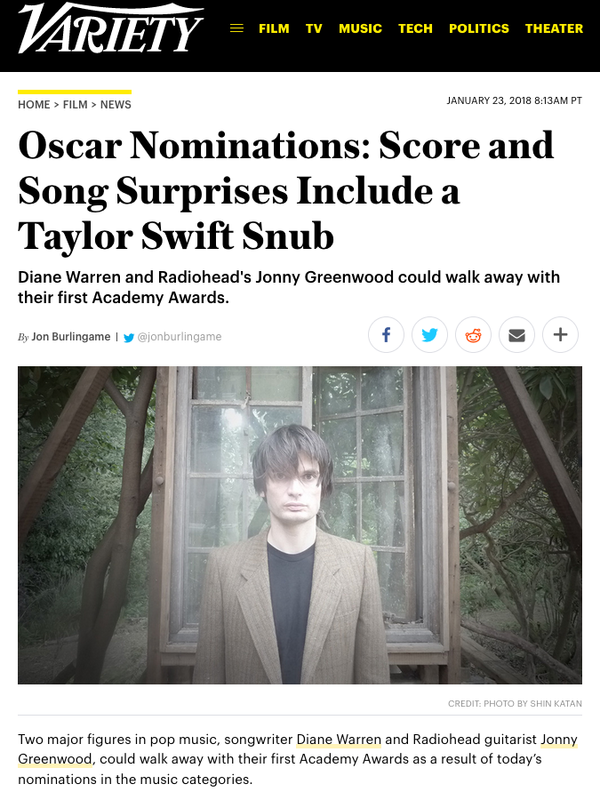 The music editors at Variety were intrigued about the fact that the winners of both music categories (song and score) at the Golden Globes were represented by the same agents. 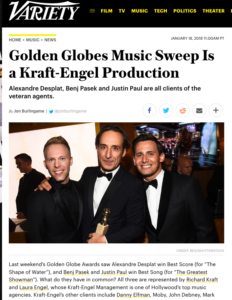 So I was dispatched to interview Richard Kraft and Laura Engel about what they do, how and why they happened to sign those particular clients (composer Alexandre Desplat for The Shape of Water and songwriters Benj Pasek and Justin Paul for The Greatest Showman), and what their role is during awards season. 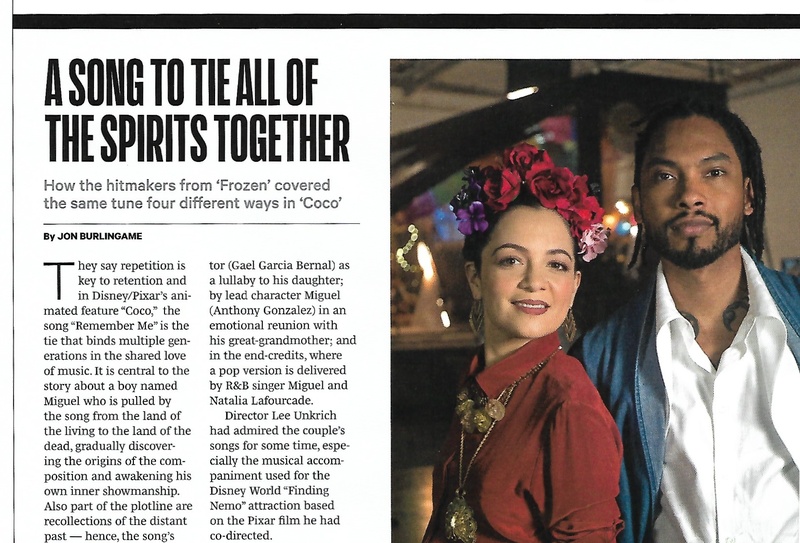 It was fun, and the Q&A was published online this week in Variety. This entry was posted in Film Music, Interviews and tagged Alexandre Desplat, Golden Globe music winners, Kraft-Engel Management, Laura Engel, Pasek & Paul, Richard Kraft, Variety on January 19, 2018 by Jon Burlingame. 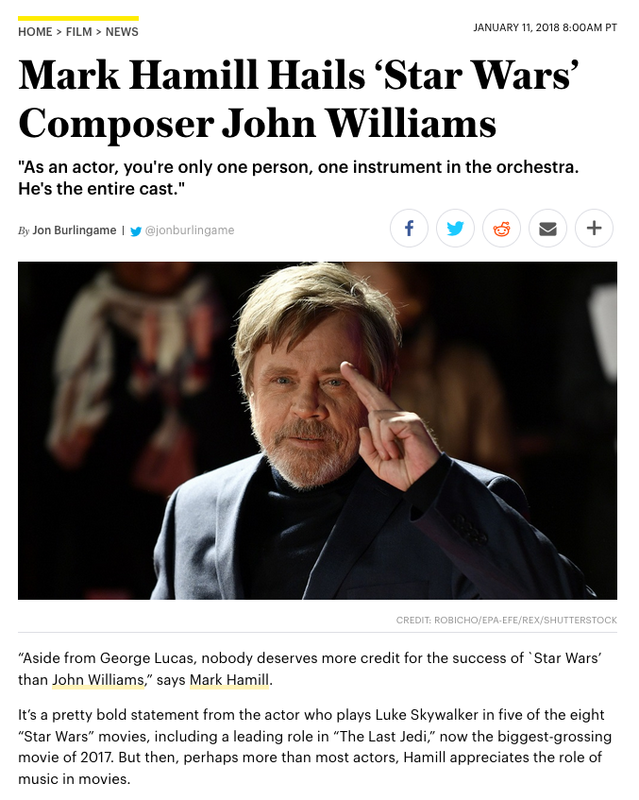 While I was preparing my John Williams piece for Variety, I had the good fortune to connect with actor Mark Hamill, who of course plays Luke Skywalker in the Star Wars films. 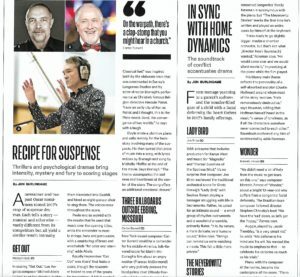 He was so enthusiastic in his praise for the maestro, and waxed eloquent in his appreciation for film music generally, that I didn’t want to use simply one or two quotes in the Williams piece. 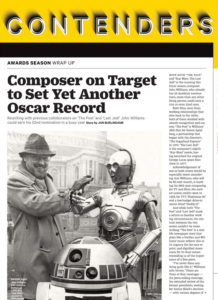 Variety editors agreed, so here is the sidebar story in which Hamill talks about his history with classic film music, and Williams in particular. 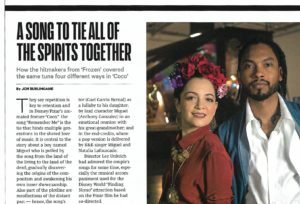 The New York Post picked it up the next day. 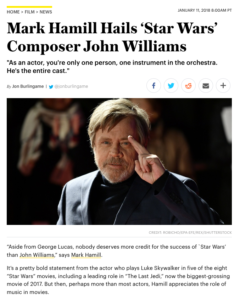 This entry was posted in Composers, Film Music, Interviews and tagged John Williams, Mark Hamill, Star Wars music, The Last Jedi, Variety on January 11, 2018 by Jon Burlingame.